So many options with this beautiful set. 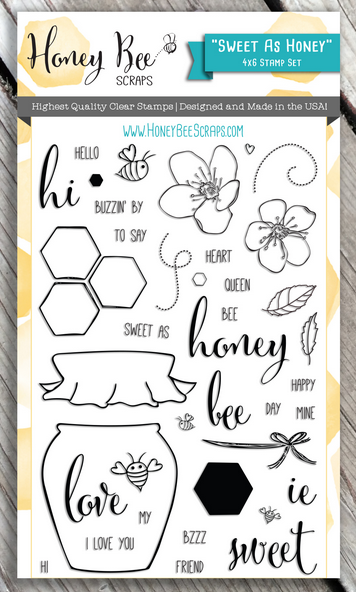 I love that designer Melissa created the Hexagons ( honeycomb ) with solid and outlines to work with. To create the honeycomb pattern I repeat stamped the hexagon outline in a pattern down my card. I then used the solid hexagon to fill in the honeycomb. I used Distress Ink in “wild honey”. To create the distress look. I stamped the image onto my craft mat first, then repeat stamped over my outlines. This gives me a variation of color to create my honeycomb pattern, I get darkest to lightest images by stamping without re-inking I can also pick up color directly from my craft mat for a textured look. I did a quick watercolor brush of Distress “Tumbled glass” for my background. I also cut out a few single hexagons and popped them up with some 3D foam squares. To complete my card I stamped the sentiment by combining three stamps to say “buzzin’ by” “to say” “hi”. There are so many different options in this great set to create the perfect sentiment to suit your stamping needs. These little bees are super adorable with their little heart wings. I also love the dotted trails. I am definitely going to get a lot of use from this set.